In the recent days MPs surprise us all with the way they vote. People’s deputies from the Party of Regions and the Communist Party repeatedly failed to vote for the decrees on celebrating the anniversaries of Volodymyr Vernadsky (1863-45, philosopher, naturalist, founder of geochemistry, biogeochemistry and radiogeology, one of the founders of the Ukrainian Academy of Sciences), Vasyl Karazin (1773-1842, scientist, inventor, civic activist, founder of the first university in Eastern Ukraine – Kharkiv University), Tymofii Borduliak (1863-1936, writer, priest of the Ukrainian Greek Catholic Church), Kvitka Tsisyk (1953-98, American singer of Ukrainian origin, popular singer of advertising jingles in the US, opera and blues singer), and events to commemorate the heroes of Kruty. After they failed to vote on decree regarding Vernadsky’s anniversary, member of Party of Regions Hanna Herman suddenly realized that something went wrong. “There was a misunderstanding because we did not hear the name clear… It has to be fixed,” said the MP. As a result, the deputies voted again and passed all the necessary decision, except those related to Kvitka Tsisyk and Tymofii Borduliak. There were not enough votes for honoring the names of these outstanding Ukrainian figures. Of course, members of the parliament may have different tastes, perhaps not everyone likes Kvitka Tsisyk’s singing, but there is a suspicion that MPs simply do not know the figures, for whom they had to vote. We have asked deputies from the Party of Regions this question. According to Olena Bondarenko, there is no any subtext in what has happened, voting for the dates showed the lack of coordination between the parliament members. As it turned out, it is hard for the people’s deputies to learn their own history. And these are the people, who have been elected parliament members. However, they seem to know a lot about expensive jewelry and brands. On May 16 every member of the parliament received a book Verkhovna Rada Ukrainy v Oblychchiakh (Ukraine’s Parliament in faces). 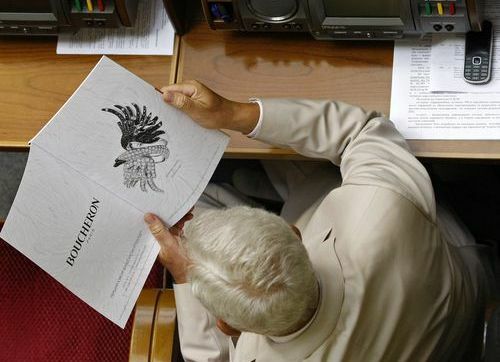 It could have been unnoticed by the public, but the book has photos not of ordinary parliament “faces.” According to Herashchenko, the book advertises “extremely expensive jewelry – Luxury Boucheron and Chopard.” The question is not even how these ads got into the book (but it would be still interesting to learn the answer), but rather that those, who put it there understood well where they should look for the target audience.